This document provides information about the Akana Policy Handler Framework. It describes the architecture of the framework, the framework API, and how to deploy extensions to the framework. The Akana API Platform includes an extensible Policy Handler Framework for implementing and enforcing policies on messages. The Policy Handler Framework is an extension of the Message Handler Framework (see the Policy Manager Message Handler Programming Guide, specialized for runtime policies, both Operational and Quality of Service. The Policy Handler framework provides a set of interfaces in addition to those provided by the Message Handler Framework that can be implemented by developers who would like to extend the base policy capabilities of the product, which are also implemented using the same framework. The policy handler framework is used to process incoming and outgoing messages of web services. This processing is typically constrained to binding specific logic, header processing, security decisions, and minor transformations. It is not intended to provide orchestration, content-based routing, or major transformations. For those capabilities, use the Virtual Service Orchestration Framework. The Policy Handler Framework is used by individual features such as the Network Director. The Network Director acts as a provider and consumer of services; in this scenario, the framework is used for processing both incoming and outgoing message exchanges. Note: this document covers only Network Director use of the Policy Handler Framework. The processing performed by the policy handler framework is dictated by policies attached to services in Policy Manager. Enforcement is the act of ensuring a policy is met by a message. Implementation is the act of altering a message so that it conforms to a policy. When the policy framework governs a service that is receiving messages, the framework enforces the policies attached to the service. It must also implement those same policies on messages that are returned to the client. Verifying that a signature is present on the request message. Verifying that the signature is valid. Implementing the policy on the response message by signing it before it is returned to the client. Implements the policies attached to the target service on the messages sent to the target. Enforces the same policies on the messages returned by the target. Once for the exchange between the client and the virtual service. Once for the exchange between the virtual service and the target service. Policies in Policy Manager are modeled according to the [WS-Policy] specification. This specification defines a policy as a set of assertions that can be grouped together in a conditional fashion using XML. An assertion is any XML element that represents enforceable or implementable rules. Both the [WS-Policy] specification and Policy Manager support the notion of assertions themselves having their own policies, so that a nesting such as policy > assertion > policy > assertion is possible. The WS-Policy specification supports the notion of a policy containing choices of assertions at any level. Policy Manager only support choices within policies that are contained within assertions, not directly within the root policy itself. Lines 01–18 represent a single policy named My Policy. On lines 04–15, the policy author has supplied an assertion named MyAssertion. MyAssertion provides two choices, MyChoice1 on line 8 and MyChoice2 on line 11. The use of the ExactlyOne element on line 6 delineates the choices. You can attach multiple policies to services and organizations in Policy Manager. You can also attach policies at different levels of the organization tree and different levels of the service definition. All the policies that apply to a given request or response message must be collected and combined so that they can be properly enforced or implemented. All these policies are combined into what is called an effective policy, or the complete set of assertions that apply to a given message. There will be an effective policy for each message (IN, OUT, FAULT) of each operation of each service being governed as described in a WSDL document. For more information about policy attachments (scopes) and effective policies, please consult the [WS-PolicyAttachment] specification. The Policy Handler Framework receives policies from Policy Manager in the XML form described in the previous section. It parses the XML into a Java representation that can then be used by policy handlers to implement and enforce. The framework has a Java API that it parses the policy constructs (Policy, ExactlyOne, All) into, but it doesn't have an understanding of the assertions that policy authors write. Instead, it delegates the assertion interpretation to domain-specific implementations provided by the policy authors. Rely on built-in facilities to marshal the assertion into an org.w3c.dom (DOM) representation. Use other XML marshaling frameworks such as the javax.xml.bind (JAXB) API within a marshaller as well. A Policy Handler is a Java class that is given a message from a message exchange to either implement or enforce a policy. A Policy Handler is actually just a Message Handler described in the Policy Manager Message Handler Programming Guide. The same Message Handler is used within the Policy Handler Framework. There are no differences between Message Handlers used in both frameworks. The differences are found in how the handlers are created through the use of factories. A Policy (Message) Handler is constructed by a Policy Handler Factory. The framework will call a handler factory with context about the handler that should be created including the effective policy and the scope of the handler. Since an effective policy can be different for each message (IN, OUT, FAULT) of each operation of a service, the scope will be the exact message the effective policy is for. In other words, a handler is created for each message of each operation of a service. If an operation has multiple faults defined in its WSDL document, the factory is called for each fault. Has access to all the assertions present within that effective policy. Can read each assertion it understands. As described in the Policy Manager Message Handler Programming Guide, a Handler Chain is a list of MessageHandlers that are invoked in order, each being given the same message as context. The Policy Handlers created from the Policy Handler Factories are put in one handler chain. The order of their execution is based on the order in which the factories were called. The Network Director acts as an intermediary, and therefore both a provider and consumer, so it includes several variations of binding and mediation support. The Network Director supports any number of bindings for both incoming and outgoing message exchanges. Based on routing dictated by the Virtual Service engine, messages received on one binding may or may not be forwarded on to the downstream service using the same type of binding. Every binding implementation is different. Third parties and customers themselves can implement their own bindings. Bindings developed by Akana all incorporate the Policy Handler Framework in a consistent fashion. The handlers created and invoked within the bindings may be different based on binding type, but the frameworks share a similar organization. For IN bindings, each binding only deploys binding handlers that are specific to the matching type of binding in addition to all global handlers. In Network Director, the WS-Policy handlers are divided between the IN bindings and the Virtual Service Engine. This enables virtual services to invoke other locally-deployed virtual services while still having policies enforced. Policy API: Provides interfaces and classes for defining policies, assertions, and assertion marshalling. Message Handler API: Provides the core interfaces and classes for Message Handlers and processing of message exchanges. Described in the Policy Manager Message Handler Programming Guide. Policy Handler Factory API: Provides interfaces and classes for creating Message Handlers, but within the context of policy enforcement and implementation. The following sections provide a brief description of these interfaces and classes. A detailed description of the API is available in the \docs\apidocs folder of your Akana Platform release directory and on the Akana documentation site (go to http://docs.akana.com/ag/apidoc_restApiDocs.htm and choose the applicable version for your installation). The Policy API is composed of a small number of interfaces and classes that can be used to represent policies and assertions. These are all in the com.soa.policy.wspolicy package. The Policy, ExactlyOne, and All classes are WS-Policy constructs. The SubPolicyAssertion interface is an Assertion extension for assertions that have nested policies of their own. An interface for assertion marshalling. An assertion is represented in the framework with the Assertion interface. Assertion is the interface that all domain-specific representations must implement. A policy author can implement this interface directly with their own class, or they can use some of the existing implementations. For example, XmlAssertion provides a default DOM representation of an assertion. JavaAssertion provides an implementation that simply wraps an existing Java object. This is useful when the author wants an assertion class that does not have to implement the Assertion interface, such as when they are using JAXB to model an assertion. To use the XmlAssertion, authors can use the existing XmlAssertionMarshaller. To use JAXB, authors can use the JaxbAssertionMarshaller. The Policy Handler Factory API is composed of a small number of interfaces and classes that can be used to provide construction logic for Policy Handlers based on policy assertions modeled in the Policy API. These can be found in the com.soa.policy.wspolicy.handler and com.soa.policy.wspolicy.handler.ext packages. The WSPHandlerFactory is the interface all policy handler factories must implement. The difference between this and a HandlerFactory in the Message Handler Framework in that it is given the effective policy as a set of normalized policy choices represented with the PolicyChoices class. Currently, Policy Manager does not allow policy choices at the root of its effective policy, only within assertions themselves. With this limitation in mind, the SimplePolicyHandlerFactory abstract class is provided for policy authors to extend for their policy handler factories. This class provides subclasses with a single choice as the effective policy, which simplifies processing. The Network Director uses the OSGi (Open Services Gateway initiative) framework for deploying features and extensions. The Policy Handler Framework dynamically constructs the chain of handlers by discovering policy handler factories published as OSGi services by OSGi bundles. The Policy Handler Framework registers with the OSGi framework for services that implement the WSPHandlerFactory interface. It organizes the WSPHandlerFactory services into groups as described in the framework/feature sections, through the use of attributes that the WSPHandlerFactory services can use to describe themselves. The following are the attributes the Policy Handler Framework will use to group WSPHandlerFactory services. Names the handler factory. Can be used by another handler factory if it needs to state a direct dependency on this handler factory (see before and after attributes). concrete—Deploy a factory instance for a specific binding (see the binding property). abstract—Deploy a factory instance at the service level so that it creates a handler for messages sent/received over any binding. Indicates which binding the factory should be deployed for (if the scope attribute value is concrete). Specifies an ordering requirement or dependency within the group of handler factories it is deployed to. The value is either the name of another handler factory or the wildcard (*). If the wildcard (*) is specified, the factory must be placed before all other factories in the group. If multiple factories have the same value, the framework orders them in the order the OSGi framework discovers them. Handler1, Handler2, and Handler3 are in the same global/binding group and are deployed first. Handler2 is given the first position in the invocation order because it specified a before attribute of *. Handler1 or Handler3 could have been second since there were no ordering constraints on either one, but in this example Handler1 will be second. Handler4 and Handler5 are in the second message-specific group. Handler5 will be deployed before Handler4 though because of Handler4's after attribute which referred directly to Handler5. For OUT bindings, these same example services would be defined with the same attributes except that the role attribute would have the value of consumer. The deployment order would be the same. This section describes the steps necessary to develop and deploy a Policy Handler. The sample artifacts described are available in the /samples directory installed with the product. In the example, a policy will be written that will dictate that a transport header be present with the same value as the operation name as defined by the service's WSDL document. The policy handler will be written to both enforce and implement the policy. The assertion used in the example is defined by the XML schema shown below. HeaderName on line 06 identifies the name of the header that the operation name must be in. Optional on line 07 indicates whether the presence of the header is optional or required. In this example, JAXB is used to bind the XML assertion to Java. The generated JAXB java class that represents the Complex assertion is shown below. When using JAXB, a JavaAssertion is generated when unmarshalling the policy. The Complex class is contained within the JavaAssertion. In this example, an optional step is taken: The JavaAssertion class is extended to provide methods that mimic the Complex class, so that clients are unaware of the use of JAXB or the necessity to extract the JAXB object from the JavaAssertion. This is completely optional. If the JavaAssertion was used directly by the handler code, we could also just use the JavaAssertionMarshaller directly, to marshal the assertion between Java and XML. Since this example is using its own custom assertion class that wraps the JavaAssertion, it also requires a custom marshaller, as shown below. A JaxbAssertionMarshaller is embedded in this custom marshaller, on line 6. The marshaller returns to the framework the assertions it supports on line 14. This tells the framework what XML elements to ask the marshaller to process. On lines 18–31 the marshaller extracts the assertion information and creates the Complex JAXB object that it can then marshal to an XML element using the JaxbAssertionMarshaller. On lines 34–47 the marshaller uses the JaxbAssertionMarshaller to marshal the XML element to a Complex JAXB object. It then wraps the output in a ComplexAssertion object. When the framework detects that the assertion has a nested policy, the unmarshal method starting on line 50 is called. In this case, on line 52, the marshaller throws an exception, since this assertion does not support nested policies. It should not be called by the framework unless the policy was somehow created incorrectly. There are two policy handlers in this example, one acting as a consumer of message exchanges and the other a provider. The source code for the provider is shown below. The header name and optional flag from the policy assertion are private data members on lines 15 and 16. The handler does not read the assertion itself. That is the job of the factory (see Source Code section). Starting on line 35, the handleMessage() method is called by the framework to enforce the policy when receiving a request (IN) message. It is not called when processing a response (OUT) message because a handler is not created for the response message by the factory (see below). On line 44, the handler retrieves the header with the name in the policy. On line 46, the handler compares the header value to the operation name. If they do not match, a MessageFaultException is generated and thrown on lines 47–52. The exception tells the framework that policy enforcement has failed and instructs it to return a fault to the client with the code and message added to the exception. On line 56, the handler checks in case the header is not present and its presence is not optional. If this is the case, it generates a different MessageFaultException with a different code and message on lines 57–62. If none of the checks fail, the handler indicates that the message has passed policy enforcement by returning true on line 64. In this example, the close() method on lines 28–30 perform no function. Hsowever, if the handler were to have allocated resources that should be cleaned up only after the entire handler chain had finished its processing, those steps would be included at this point. The source code for the consumer handler is shown below. The purpose of this code is to create a header with the name in the policy with the value of the current operation, so that the message passes enforcement at the downstream service. The source code of the policy handler factory is below. Only one factory is needed to create both the provider and consumer policy handlers. The handler factory extends SimplePolicyHandlerFactory since there is no chance of getting top-level policy choices. On line 14, the assertion is extracted from the policy using the getAssertion() method on lines 46–65. That method recursively searches for an assertion with the Complex assertion's name. On line 20, the check is made to see if a provider handler should be constructed and returned. If the role of the handler to be returned is HandlerRole.PROVIDER and the message that the handler will process is the IN message, a provider handler should be returned. One line 29, the check is made to see if a consumer handler should be constructed and returned. If the role of the handler to be returned is HandlerRole.CONSUMER and the message the handler will process is the IN message then a consumer handler should be returned. A common point of confusion is that, although the message being processed is sent out of the container, it is still the input message of the downstream service's operation, so it is the IN message, not the OUT message. The classes described in the previous section must be packaged in an OSGi bundle so that they can be deployed to the Akana container. The ComplexAssertionMarshaller and ComplexPolicyHandlerFactory must be published as an OSGi service so that the Policy Handler Framework can load them. In this example, Blueprint is used to construct and publish the OSGi services using Spring. Spring and Blueprint are not requirements, but are used here for simplicity. 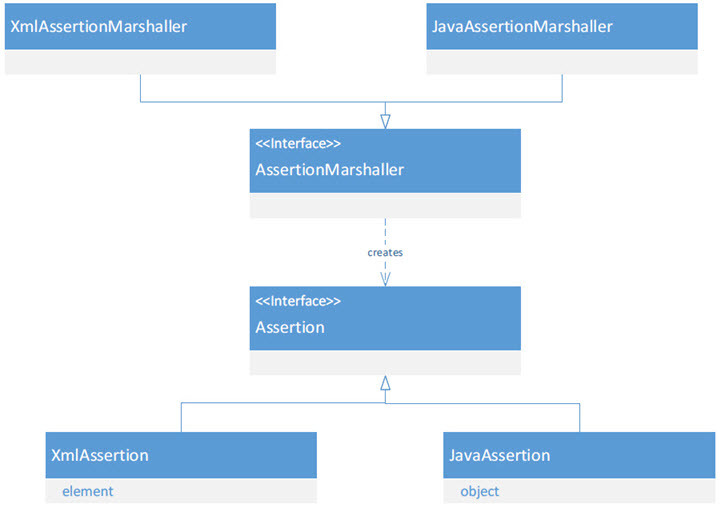 The assertion marshaller is published using the following Spring snippet. Lines 01–21 construct the ComplexAssertionMarshaller and all its dependencies. The JaxbAssertionMarshaller that is used within the ComplexAssertionMarshaller is constructed on lines 05–16. The ComplexAssertionMarshaller is published as an OSGi service on lines 23–27. It must be published using the AssertionMarshaller interface. It is given a name property on line 25 as a good practice when publishing OSGi services. The name should be unique among all services published. The ComplexPolicyHandlerFactory is published using the following Spring snippet. Because the policy handlers are validating and creating transport level headers the factory will be published with a concrete scope instead of abstract. Although abstract is easier for defining policies that are independent of binding, not all bindings will have transport headers and there will definitely not be transport headers when a virtual service invokes another virtual service in the same container. On lines 03–10, the factory is published as a provider-side HTTP factory. On lines 12–19 the factory is published as a provider-side SOAP factory. On lines 21–28 the factory is published as a consumer-side HTTP handler. On lines 30–37 the factory is published as a consumer-side SOAP handler. An OSGi bundle must have a Manifest to define its dependencies. The following is the Manifest for this example. Lines 01–06 hold general information about the Bundle. Lines 07–22 hold the package dependencies for the Bundle. All packages not defined within the bundle that are imported by code in the Bundle must be listed here. The only exceptions to this are packages that are in the global classpath of the Akana Container, such as the Java JRE and Spring packages. Lines 23–26 list the packages that are exported, or published, to other bundles loaded in the system. This is required so that the Policy Handler Framework can load the assertion classes as they are constructed using a JAXB context from another bundle and could possibly be used by a user interface bundle for displaying the policy in the Policy Manager Management Console. An Akana container will have a folder on the file system with a name that matches the key of the container seen in the Policy Manager Management Console. Under that folder is a sub-folder named deploy. Bundles that provide extensions to the container, such as additional message handlers, are placed in the deploy folder. When the container is restarted, the services published within any Bundles in the deploy folder are imported into the container, and all published handler factories and assertion marshallers are picked up by the Policy Handler Framework.